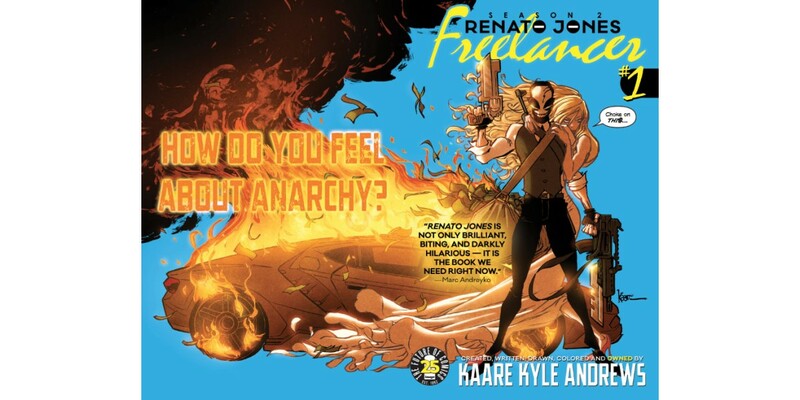 International superstar graphic novelist, film director, and humanitarian to the elite Kaare Kyle Andrews is proud to celebrate the super rich with RENATO JONES: SEASON TWO, the only series about a hero targeting the super rich, and an ad campaign to promote the new arc's Wealth Care storyline. Never has there been a more exciting time to be super rich. With a billionaire president and his cabinet of billionaires and millionaires, finally we can target the needs of the elite. No longer dragged down by the poor, the sick, and the pre-conditioned, as the $600 billion dollars in tax cuts generated by the proposed changes in health care have shown us—Health Care is Wealth Care. RENATO JONES: SEASON TWO, Part One: Freelancer promises a complete luxury experience from beginning to bloody end. RENATO JONES: SEASON TWO #1 (Diamond Code MAR170714), RENATO JONES: SEASON TWO #1 Cover B SPAWN (Diamond Code FEB178668) and RENATO JONES: SEASON TWO #1 Cover C SPAWN B&W (Diamond Code FEB178994) are available on Wednesday, May 10th. Andrews is responsible for writing and drawing some of the most controversial moments in superhero comics, including that one time Spider-Man killed Mary Jane in Spider-Man: REIGN and the time Iron Fist: THE LIVING WEAPON turned a skyscraper into a kung-fu robot warrior to fight a God in the streets of New York City. RENATO JONES: SEASON TWO #1 will be published by Image Comics on May 10th.